Any idea of what the numbers are – what buildings ? Love this one. For years I’ve remembered a RR control tower on the south side of Union Terminal. I thought it was by the Houston St. Viaduct but it didn’t show in pictures. Now I see that it was beside the streetcar trestle. I’ve seen that in other photos and have wondered what that thing was. What did it do, Bob? 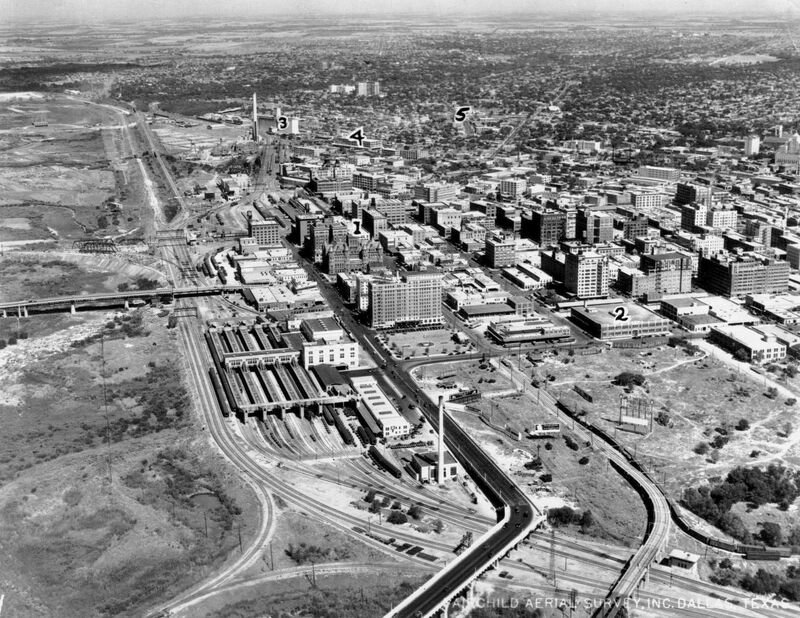 It was the switch control for the multiple tracks into the Union Station from the south. The one behind the School Book Depository controlled the switches from the north. I think I’m thinking of something else: the tall, thin structure that looks like a smokestack. south of Union Station. That was the power plant for the station. It was right beside the bridge and next to the Railway Express docks. Thanks to Brian Gunn, I’ve added his now-and-then image as a helpful guide. What a great photo this is. 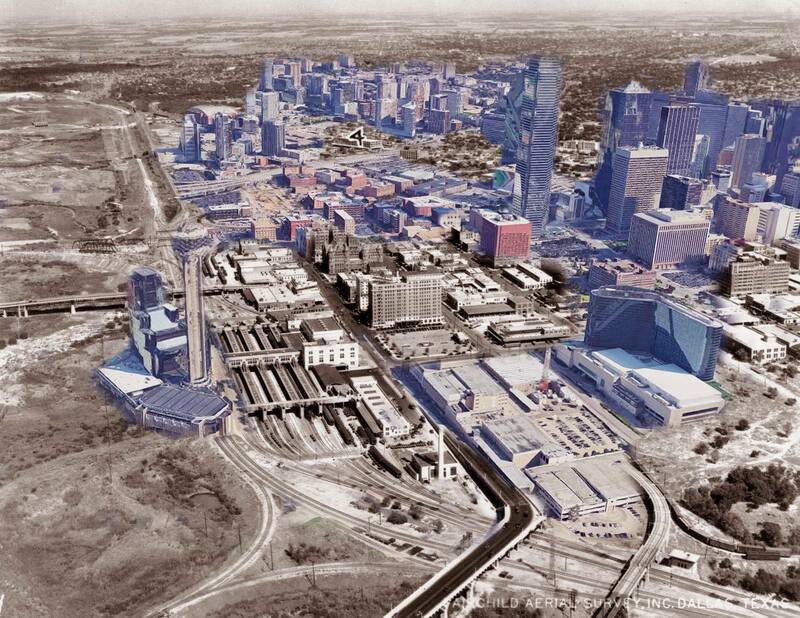 It makes a nice addition to my own collection of old Dallas photos…. Oddly, it looks to me as if the TSBD/Rock Island building has only 6 floors. But if the picture is from the 1925-1934 period, the building definitely would have 7 floors. 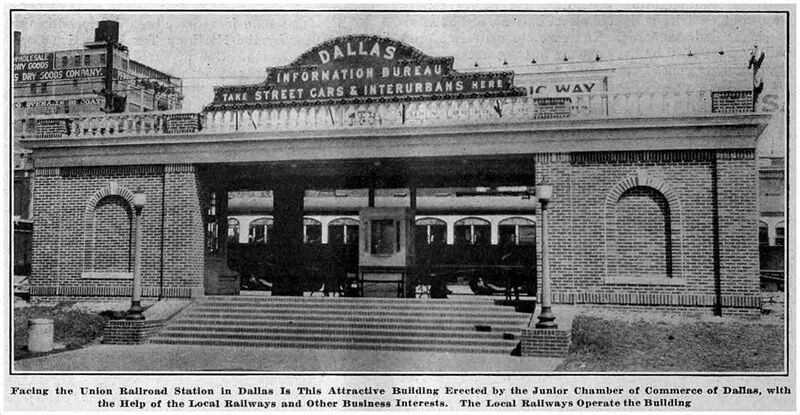 Anyway, thanks for finding yet another great old Dallas photo. It’s a beauty.